Who's On The Ballot | Everything you need to know about NYC elections. Please check back soon to see who’s on your ballot and learn about candidates in the June 25th Primary election. For now, use Who’s On The Ballot to register to vote, find out how to get an absentee ballot, check your registration status, and much more. The next election is June 25, 2019. 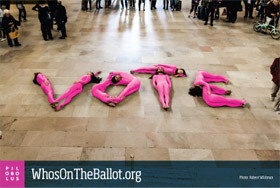 See how we partnered with Pilobolus to get out the vote across the five boroughs. February 25, 2019Special Election for Public Advocate TOMORROW, 2/26!